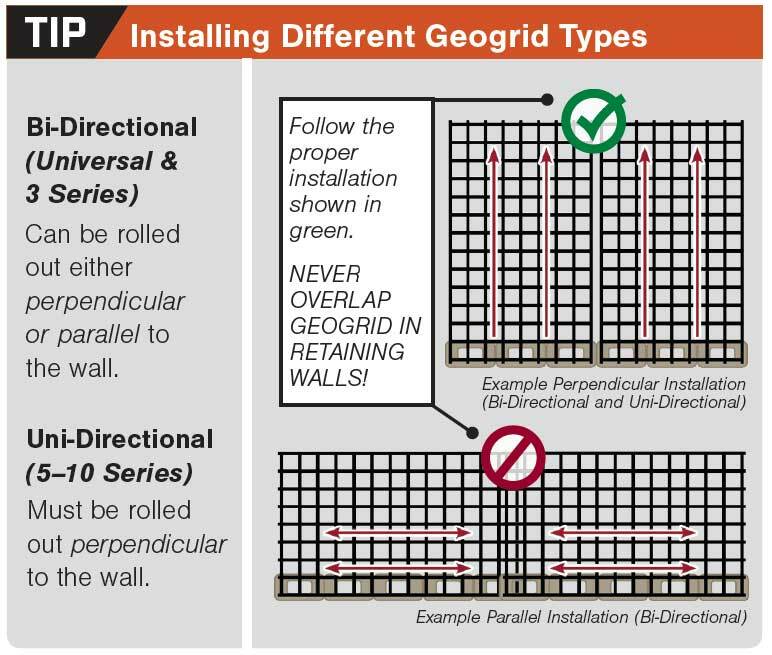 Bi-directional ( biaxial) geogrid which may be installed either perpendicular or parallel to the wall for lengths 3, 4 or 6 feet. Perfect for retaining walls up to 10 feet in height and is bi-directional. This geogrid may be placed parallel to or perpendicular to the retaining wall. Uni-directional. This geogrid must be placed perpendicular to the retaining wall to retain its strength. Bi-directional. This geogrid must be rolled out in the direction of the road. We also offer uni-directional 10 Series, 11 Series, 12 Series, 18 Series, 19 Series and 35 Series. In addition, we offer pricing on Synteen, Mirafi and Strata geogrid. SRW Products engineers use LTDS calculations to identify and reduce factors which can impact the long-term performance of a geotextile reinforced system. This allows us to offer a variety of products. Retaining walls play a very important role in protecting landscapes from natural elements. It is essential that the wall is constructed correctly using proper material to ensure long term stability. If corners are cut and stabilizing grid is not used the wall can lose stability and fall, endangering people and damaging the landscape. When hiring professionals to do the work, always check their experience in this area of construction. There are several reasons why retaining walls fail. The most common being inadequate drainage behind the wall. With poor drainage, moisture circulates, freezes and thaws which can happen on a daily basis during the colder seasons. Some northern states experience this more often during Spring months and then again in the fall. With a clay back-fill, during the evenings freeze sets in and then ice starts melting and working its way deeper into the surrounding area and pushes outward. In other cases, the walls are being forced to hold back more soil than they can handle. While in most cases this is caused by novices who really do not know how to properly construct a retaining wall, there have also been cases with landscapers, who should know better, doing the same thing. If a retaining wall is built too high there will be no reinforcement to handle the force. Customers are spending thousands of dollars to build these retaining walls and then thousands more to tear them down and start all over again. Anyone can go search online about failing retaining walls and discover just how disastrous the outcome can be. A retaining wall is actually quite straight forward and the materials needed are not overly expensive. In order to construct the wall properly the process will require some additional digging, backfilling and compacting. The upside, its very inexpensive compared to the cost of having to start all over again. Sadly, many people, in an effort to save time and cost, do not know about stabilizing grid and whether they even need it in their construction. In many cases, they will hire contractors who truly do not understand how a retaining wall actually operates or when stabilizing grid is needed. The money they end out saving, gets spent when the wall needs to come down and they have to start over. 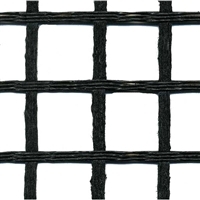 Stabilizing grid from SRW is a woven fabric that is extremely strong. This fabric has high tensile strength and is pinned between the layers of the retaining wall. This extends into the soil the wall is retaining and locks the block or stone wall together with the soil behind. 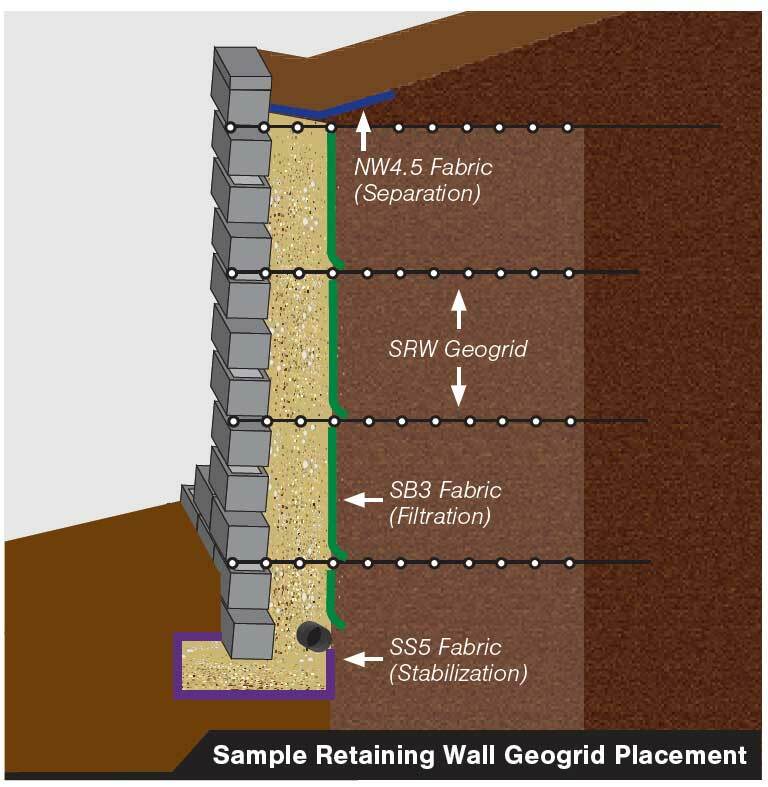 Determining wether stabilizing grid is needed for your wall will depend on the wall building material as well as they type of soil to be retained. Clay soils, for example swell when moist and retain water and thus are the hardest to retain. 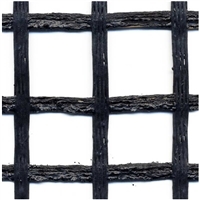 When clay soil is to be retained, stabilizing grid is highly recomended. The material used for a retaining wall matters a great deal, the more massive the material is, the less stabilizing grid will need to be used. For example, most six inch or eight inch wide split face limestone walls, stabilizing grid should be considered if the exposed height is over 24”. 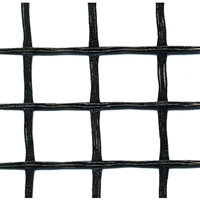 stabilizing grid is most desireable for man made walls with a height of 36” to 48”, depending on the design and size. If there is a slope at the base of the wall stabilizing grid should also be taken into consideration. Once you have a wall that is over 6 ft in height, constructed with 24”or wider limestone or similar blocks and very dense material, stabilizing grid should be used. First you must excavate the soil area for reinforcement. All existing soils should be removed in order to have maximum embedment (or enclosed area) length for the stabilizing grid. 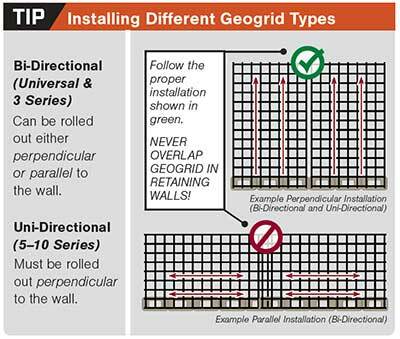 There should be a good level soil condition behind the wall units in order to place each stabilizing grid layer. You need to cut the stabilizing grid in sections from the roll to a specific length (the embedment depth). The stabilizing grid should be rolled in the direction from the wall toward the embankment. 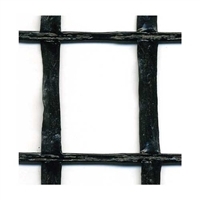 You should always check the manufacturer's specification for biaxial or unbiaxial stabilizing grid. In most cases, the stabilizing grid is rolled perpendicular to the face of the wall. You have to hook the stabilizing grid over the Keystone pins to ensure a positive operating connect between the unit and the stabilizing grid. Always be sure the stabilizing grid is placed within one inch of the wall's face. Secure the stabilizing grid by pulling the pinned stabilizing grid taut in order to eliminate any loose folds. 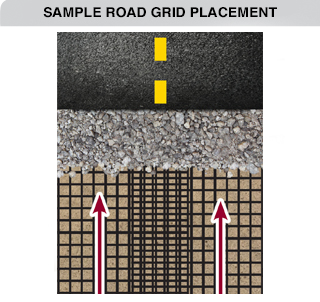 Secure or stake the back edge of the grid before and during the back-filling and compaction. If desired, you can remove the stakes after the back-fill is in place. You can then place additional sections of grid, abutting each other, for a more continuous coverage for each layer. Finally, you will place back-fill over the grid in 8 inch lifts. Give a minimum of 6 inches reinforcement fill cover before driving any equipment over the grid. Stay away from driving or turning any vehicles directly over the grid, this could cause excessive damage.